The US truly is exceptional. It seems we are the one nation that feels free to bomb anyone, any time. Syria has accused the US of carrying out a “brutal massacre” with a bombing attack in Deir al-Zour province. The overnight strikes killed an estimated 100 pro-government fighters near the Euphrates river. 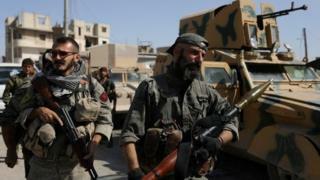 The Syrian Ministry of Foreign Affairs said it had written to the United Nations, demanding international condemnation. The US said it was responding to an “unprovoked attack” on allied Kurdish and Arab fighters. The Middle Euphrates Valley serves as an informal demarcation line in eastern Syria, with the government controlling the western side and the US-backed Syrian Democratic Forces (SDF) the east. Syria described the latest strikes as “a war crime and a crime against humanity”, and said the US was directly supporting terrorism. Elsewhere in Syria on Thursday, government warplanes bombed towns in the rebel-held Eastern Ghouta region, near the capital, Damascus, for a fourth day. The US has no right to respond to an attack on “allied Kurdish and Arab fighters.” If we were to respect the Syrian government’s sovereignty – something the US government pays great lip-service to when the sovereignty involved is Crimean – then they’d have to admit that they haven’t been invited to be there, with all the troops and guns, and that the US has no business injecting itself into a battle between the Syrians and the Kurds. I feel bad for the Kurds; they trusted the US. And, now that the US has let them be marginalized and suppressed once again, the US has decided to heat up a battle around them, with a genocidal and violent government. How is any of this going to help anyone in the slightest? How is any of this going to help anyone in the slightest? A vast river of money. On another axis, the USA’s engagement pretty much fits the “convenient war” category, politically. On another, an empire realises a decent armed force requires veterans. Live-fire exercises such as these must be invaluable, from that perspective. re feeling sorry for the Kurds, I don’t think their trusting the USA is a good reason. Pretty sure they damn well know just how reliable the USA is and its history in the area. 1991 was not a good year for them, for example. No, I don’t think they’re that naive. They probably think it’s their least-worst option. John Morales covered it pretty well; I also came to comment about the huge profit in dealing death. Yup, John Morales put it all together. Can’t have industry without the need for new stuff. So out with th old bombs, Senate will buy new ones. Who cares, if some brown people die in the process? Yes, probably. The Turks have been periodically trying to wipe them out, as had the Iraqis. They’re stuck between two dubious patrons: Iran and the US. Apparently Israel is being friendly with them, too – I wonder what they want.